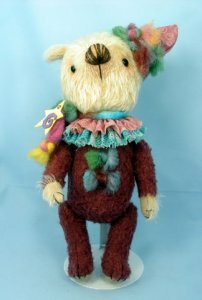 12", Long sparce cream colored mohair head and paws, purple matted body suit, brown embroidery floss claws, nose and mouth, two tiered neck ruffle in blue and light purple with matching hat, multi colored yarn bows on chest and hat with same yarn used as neck ribbon. Very short legs. Fully jointed. Signed and dated by Cindy.